Share Cedric Watson & Bijou Creole's EPK! Only a few years after moving to Lafayette from Sealy, Texas, Cedric Watson has become one of the most prolific contributors to Acadiana’s recent outpouring of roots music. Through recent recording projects—his collaboration with accordionist Corey Ledet on Goin’ Down to Louisiana andhis work with the highly-acclaimed Pine Leaf Boys—Watson has quickly become one of South Louisiana’s most recognized artists. Though it’s clear in these records that his appreciation and devotion to Creole and Cajun music’s past is strongly influential on his playing style, his distinct presence and creativity is easily noticed in every project. It was only a matter of time before a full and unadulterated Cedric Watson recording came into being, and on this self-titled release the talent and spirit we’ve all come to expect from this young Creole musician shines through. A healthy sampling of solid and funky Creole-rooted tracks like Boozoo’s “Tee Black” and the original “Ma Chère Grandmère” feature Watson’s strong and grooving accordion work weaving over a killer rhythm section, and his masterful fiddle skills and stirring voice stand out on the Cajun-tinged waltz “Tu Seras avec Moi”. Some of his songs borrow heavily from traditional standards, but instead of sticking to the same old lines, he uses these songs familiar themes like a wide platform on which to let his own sense of experimentation and playfulness to come through. Interspersed amongst these traditional-styled tunes are some particularly interesting stand-outs. The rollicking “Zozo Noir” highlights a sliding fiddle hook and sweet-toned guitar ride over a swinging beat reminiscent of shuffling poodle skirts and bobby socks. The arresting Juré “J’ai été tout autour du Pays” reflect his obvious respect for the origins of Acadiana’s cultural music while contributing to engaging rhythm of the album. Watson’s productivity and talent and ability suggest he’ll soon be cutting more gems for us all to enjoy. Cedric Watson is going to be huge, of this I have no doubt. He is the rising star of Cajun music and knows how to get the crowd moving, even with the occasional slower waltz although he’s more at home rocking the dance with his uptempto take on zydeco and Cajun traditions but with some really pleasing touches connecting the music to it’s African and Caribbean roots. The last song in the set had one of the deepest Afro Centric drum patterns I’ve heard in a while. Couple this great musicality with his cheeky banter and poster boy looks and I’m sure you will see this boy at least supporting a major tour very soon - Mr. Springstein, are you looking? Yet Watson also points to a small resurgence in the Creole fiddle. At one time, only a few stalwarts -- most notably musician D'Jalma Garnier -- were keeping the tradition alive. Among current bands, the Frank Family Band includes a fiddle, as does Dexter Ardoin and the Creole Ramblers. Even Jeffery Broussard -- who with Zydeco Force helped launch the contemporary zydeco sound -- is now playing fiddle. Watson's own future includes a tour of France and England this summer -- another sign that there's a growing audience for the traditional Creole sounds. "Slowly but surely zydeco musicians will start playing more French music, and it's already starting to happen," Watson says. The songwriter Wilson Savoy, a long and lanky accordionist in a white mesh farmer’s cap, sang in Cajun French with whoops of excitement. A bleating melodic phrase from his button accordion was echoed by a high-pitched fiddle line and shoved along by an impatient rhythm section of guitar, bass and drums. A spell was cast, combining a mysterious past — the nearly forgotten dialect and the archaic squeezebox’s red bellows — with an unabashed rock ’n’ roll energy conducive to the elbow-flying, hip-swiveling spirit on the dance floor. The band sustained that spell for 90 minutes. The fiddler Cedric Watson, dressed in a blue Cajun Mardi Gras costume with yellow and green fringe, closed out the show with a new arrangement of “Zydeco Gris Gris.” Mr. Watson sawed out the infectious tune and led the cries of “Zydeco!” The musicians’ fellow 20-somethings in the crowd hollered right back. This was the Pine Leaf Boys’ seventh show in five days, and if you had spent the Mardi Gras weekend in Lafayette, the biggest city in the Cajun region known as Acadiana, you could have also seen the Lost Bayou Ramblers at the Blue Moon Saloon on Saturday night and the Red Stick Ramblers at 307 Downtown on Sunday night. At each spot you would have found young dancers responding with the same enthusiasm. These three Lafayette bands, with a fourth — Feufollet, a teenage group that spent the weekend touring the Midwest — form the core of a renaissance in Cajun and Creole music. After years of recycled arrangements and graying performers and listeners, Acadiana’s dance halls are suddenly filled with young musicians, young dancers and a hard-rocking approach to the old acoustic instruments. Next month Arhoolie Records will release the Pine Leaf Boys’ second album, “Blues de Musicien,” an impressive recording that may vault them onto the national roots-music scene — though probably not onto the pop charts. They are introducing the album with an East Coast tour that brings them to Connolly’s in Manhattan on Sunday night. Cajun music is the fiddle-and-accordion-based sound invented by French immigrants in rural southern Louisiana and first recorded in 1928; Creole was the variation created by their African-American neighbors. In the 1990s Cajun and Creole were eclipsed on the local music scene by zydeco, an outgrowth of Creole that was bluesier and more percussive. There were some great zydeco acts in the ’90s — Beau Jocque, Boozoo Chavis, Geno Delafose, Nathan & the Zydeco Cha Chas — but they largely abandoned the fiddle, the waltzes and the French language, all essential elements of Cajun and Creole. The Pine Leaf Boys are able to bring back those neglected Cajun aspects without sacrificing any of zydeco’s dance-floor excitement. ON the Sunday afternoon before Mardi Gras, Marc and Ann Savoy gave a tour of the home where their four children, Wilson, Joel, Sarah and Gabie, developed their deep affection for Cajun culture. Outside Eunice, La., northwest of Lafayette, the 1911 white farmhouse with the yellow trim and red roof sits at the end of a long driveway flanked by old cypress and oak trees and at the center of a 200-acre farm that belonged to Marc’s grandfather. There are home movies, Ann Savoy said, of her children in their pajamas sprawled on the screened porch with their coloring books while some of the greatest figures in Cajun music — Dennis McGee, Dewey Balfa and D. L. Menard — jammed with the parents of the oblivious children. With the partial exception of New Orleans jazz culture, young black American musicians rarely spend much time looking to the distant past for inspiration. 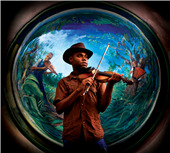 One exception is Cedric Watson, a 22-year-old Creole fiddler from the prairies just west of the zydeco hotbed of Houston. Watson's interests extend beyond zydeco, back to the music called "la-la," the pre-electric folk material of his Louisiana Creole ancestors. Here, he performs these French-language waltzes, reels and two-steps with a couple of the few remaining older practitioners, and the result is as joyous and unexpected as that ivory-billed woodpecker sighting a few years back. This music was supposed to have gone extinct a decade or so ago, and now it appears safe for another couple of generations. With 1,117 nominees — performers, songwriters, producers and more — sprinkled over 110 categories, the Grammy Awards can be an unnavigable thicket. Here are some worthy discoveries that shouldn’t be allowed to slip through the cracks. An aggressive and gifted reanimator of Louisiana Creole music, Cedric Watson sings in entrancing brays and yelps and plays fiddle and accordion in cocksure fashion. His first proper solo release “Cedric Watson” (Valcour), nominated for best zydeco or Cajun music album, is dynamic, filled with frenetic yet supple music. While Mr. Watson, from Lafayette, La., has played with the well-regarded revivalists the Pine Leaf Boys (also nominated in this category), he’s more thrilling on his own, and the most radical moments here are “J’ai Été Tout Autour du Pays” and “La Valse de Grand Basile,” nimble rearranged versions of two traditionals. New Orleans gave the world jazz, but head to Acadiana, a 2 1/2-hour drive west of the Big Easy, to hear a traditional style of music that can be just as infectious, even if it doesn't enjoy anything like the same popularity. French settlers came with their fiddles to Louisiana's bayous after being expelled from Canada in the mid-18th century — the Great Upheaval chronicled by Longfellow in his epic poem Evangeline. When German immigrants arrived with their accordions a little later, Cajun music was born: an addictive gumbo of rosined strings, reedy bellows and French lyrics that's as much about joie de vivre as it is about its instrumentation. Cajun music may have dwindling appeal in an age of hip-hop and death metal, but it's played with a defiant vigor that must be experienced live. Gather with the warm-hearted, incongruous crowds (bikers, grannies, musicologists) to jitterbug and drink on Saturday mornings at tiny Fred's Lounge, tel: (1-337) 468 5411. Located in Mamou, pop. 3,566, Fred's gets going at the unlikely hour of 7:30 a.m. Manager Sue Vasseur, 77, who opened the place in 1946 with her husband — the late, eponymous Fred — invariably steps up to the mic between sets from featured bands, swigs from the chilled bottle of Hot Damn cinnamon schnapps she keeps in a natty gun holster and spouts house rules like "The only four-letter words I allow are love and beer." In nearby Eunice, catch the weekly Rendezvous des Cajuns, Cajun music's Grand Old Opry, which is staged on Saturday evenings at the Liberty Theater, www.eunice-la.com/libertyschedule.html. This onetime silent-movie house lies just across the street from the Cajun Music Hall of Fame and Museum. Alternatively, you could listen to the radio broadcast of the show on your way to Breaux Bridge — an hour's drive southeast on two-lane roads that zipper through golden soybean fields, rice paddies and crawfish ponds. Upon arrival, make your way to La Poussière Club, tel: (1-337) 332 1721, where you can waltz and two-step to the rhythms of legendary accordionist Walter Mouton. Mouton has held court on Saturday nights with the Scott Playboys for over three decades. Just 20 minutes west of Breaux Bridge, Lafayette is the still beating heart of the Cajun music scene. At joints like the Blue Moon Saloon, www.bluemoonpresents.com, or the Grant Street Dancehall, www.grantstreetdancehall.com, you can hear Cajun music performed by younger musicians like CEDRIC WATSON, the Pine Leaf Boys, the Figs, and Chris Stafford and Anna Laura Edmiston of the band Feufollet. The latter plays regular gigs in and around Lafayette, and Cow Island Hop, its latest album, astonishes with its mix of old-time standards and idiosyncratic, jazzy licks. But while the infusion of new musical blood has gladdened older locals, there seems no doubt that it can only stave off inevitable decline. Even at its peak, Cajun's appeal was regional. And just as Louisiana continues to be battered by annual hurricanes, so the homogenization of American culture is eroding Cajun's home following, reducing the music to a cultural curiosity and subject for historical theses. "We're losing our culture as quick as we're losing our coastline," worries Toby Rodriguez, a visual artist and local bon vivant whose family has been in Cajun country for generations. That means there's no time to lose. Grab your dancing shoes and, as they say in these parts, laissez les bon temps rouler. Let the good times roll. As one of the brightest young talents to emerge in Cajun or Creole music in the past few years, Cedric Watson is a fiddler, vocalist, accordionist and songwriter of seemingly unlimited potential. 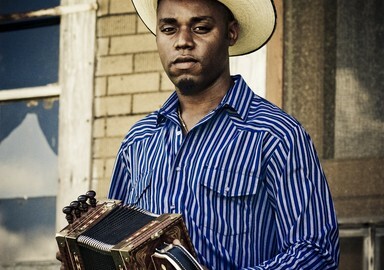 Born in 1983, Cedric grew up in San Felipe, Texas surrounded by the sounds of blues, old soul, country and zydeco. Unlike his hip-hop focused peers, Cedric was drawn to the old-style French songs of Southwest Louisiana and the greater Houston area. He soon made his way to Lafayette, LA where he was enthusiastically accepted into the musical community and immediately recognized as an important participant in the continuity of Creole music. Cedric has played with some of the great family names in Creole music, including Dexter Ardoin and the Creole Ramblers and Jeffrey Broussard and the Creole Cowboys. With the Pine Leaf Boys, Cedric expanded his repertoire of Cajun songs while adding his Creole and zydeco foundation to the band's true-to-the-roots Southwest Louisiana sound. He plays old La-La French music (traditional Creole music) in a trio of accordion, fiddle and guitar with his two musical godfathers, Edward Poullard and James Adams, in Les Amis Creole. With accordionist Corey "Lil' Pop" Ledet, Cedric turns to the more blues and R&B influenced songs of Clifton Chenier, John Delafose, Canray Fontenot, and Bebe Carrier. Now Cedric continues to explore the roots of Louisianas Creole music with his own band, Bijoux Creole. Playing a variety of old-school zydeco styles, original material and Creole traditionals, the polyrhythmic and syncopated sounds of Africa and the Caribbean are unmistakable in this ensemble of talented musicians. Cedric has been making a name for himself reviving the old Creole fiddling styles of Canray Fontenot and Bebe Carrier, injecting a healthy dose of his own personality and ingenuity, and bringing them to an ever-broadening audience. 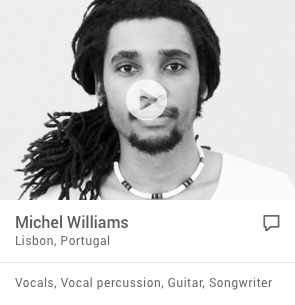 He has played across the United States as well as in France, Nova Scotia, Haiti and Spain, and would like next to go to West Africa and other parts of the French Caribbean. He has a keen interest in connecting Louisiana Creole music back to its homelands. "I want to present the Creole Nation of Louisiana to the Creole Nations in other parts of the world, to make these Creole cultures aware of the one in Louisiana, and vice versa." Cedric's creative style and obvious joy in playing make him an engaging and exciting performer. Moving with ease from fiddle to accordion, his natural playfulness on stage makes him just plain fun to watch. 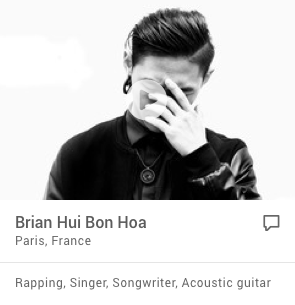 His soaring, soulful vocals, all in French, remind us of a time long ago. And his interest in reconnecting with the varied roots of the music in other parts of the world will make for an interesting ride. It will be nothing short of exciting to see what he does next. Cedric Watson is represented by Eye for Talent and will be assisted by that agency in creating and maintaining tour budgets and planning. two 45 minutes sets, or 1 90-min. Repertoire includes zydeco standards and originals.